Announcement "Liberty Bell March, played by the Edison Concert Band." Here we have a glimpse into the late 1890's, with a wonderful early brown wax recording of this great Sousa march. The announcement portion of this cylinder is damaged, but can still be made out. Edison's early cylinders were recorded at 125 RPM and would run for about 2 & 1/2 minutes. John Philip Sousa (1854-1932), wrote about 100 marches. He led the U.S. Marine Band from 1880 until 1892, when he formed his own band. Sousa was not an admirer of the early phonograph, thinking the recordings sounded awful. That did not stop him, however, from having his band make many records for the phonograph -- usually without he himself attending the recording sessions. 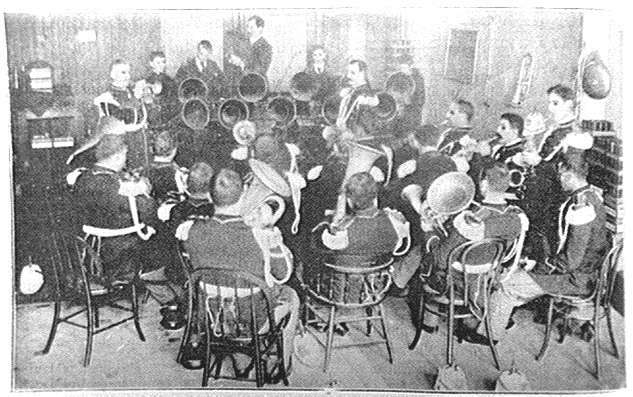 Click here to see a photograph of the U.S. Marine Band making a recording; to see more, click here.